InVade Bio Drain 4 Gallons | Fountain City Art Ctr. Invade Bio Drain is a scum eating citrus oil that breaks down bacteria that can cause clogs in drains and eliminate drain flies. It can be used daily and only requires water. With a thick syrupy consistency, it sticks to the walls of the drain and the product begins to break down the organic matter present. 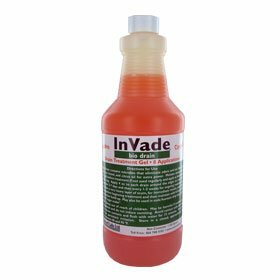 Each application of Invade Bio Drain requires only four ounces. This product is to be used specifically for drains but can also be used to eliminate sugar snakes in soda fountain drip trays. It is also safe and effective to use in mop buckets and trash chutes and urinals. If you have any questions about this product by Invade, contact us by completing and submitting the form below. If you are looking for a specif part number, please include it with your message.